1,001 Opportunities to improve your score on the ASVAB AFQT If you have your sights set on a career in the U.S. Military – but the thought of taking the ASVAB AFQT is having you seeing stars and stripes – this test-prep guide offers 1,001 practice opportunities to increase your chances of scoring higher. 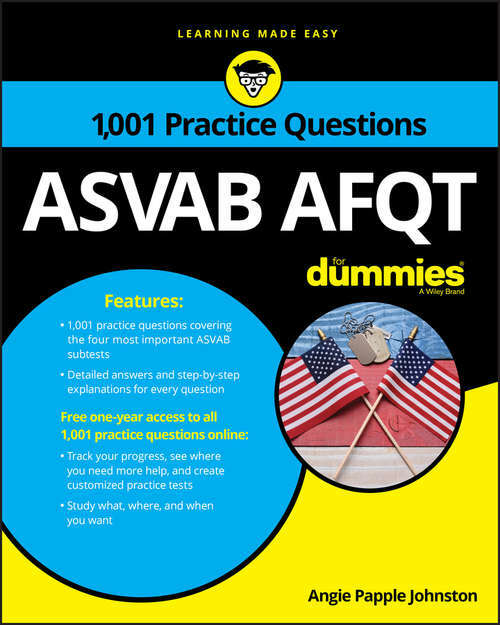 Covering the four subtests, 1,001 ASVAB AFQT Practice Questions For Dummies helps you strengthen your test-taking muscles so you can perform your very best on the big day – and qualify for the military branch and job you want. Since the test was first introduced in 1968, more than 40 million people have taken the exam. If you want to join the ranks and go on to enjoy a fulfilling and prosperous career in the Air Force, Army, Marines, Navy, or Coast Guard, it's essential that you achieve a passing score on the ASVAB AFQT – the first four sections of the ASVAB. All the expert test-taking tips, strategies, and practice questions you need to do just that are a page away. Includes free, 1-year access to practice questions online Provides detailed answers and explanations for every question Covers everything you can expect to encounter on exam day Offers tips for using your time wisely If red, white, and blue are in your blood, the 1,001 practice questions inside will help you pass the ASVAB AFQT with flying colors.